Desde el punto de vista metodológico, se optó por el análisis de futuros alternativos por dos motivos principales: (a) su indudable valor sintetizador de realidades tan complejas y dinámicas como la presentada; y (b) la voluntad de exponer un caso práctico resultante de la aplicación de dicha técnica, siguiendo la formación recibida en el curso United Nations Joint Mission Analysis Centre (UNJMAC) que se imparte cada año en el Norwegian Defence International Centre (NODEFIC). Desde el 21 de noviembre de 2016, buena parte los sectores centro y este de República Centroafricana (RCA) se han convertido en el teatro de operaciones de una recurrente y violenta lucha armada entre facciones ex Séleka. Hasta la fecha, una coalición liderada por el Front populaire pour la renaissance de la Centrafrique (FPRC) y que aglutina alos grupos Mouvement patriotrique pour la Centrafrique (MPC) y Rassemblement patriotique pour le renouveau de la Centrafrique (RPRC), prosigue su ofensiva militar contra la facción Unité pour la paix en Centrafrique (UPC) para arrebatarlesus territorios y recursos en las prefecturas de la Ouaka, Basse-Kotto y Mbomou. En definitiva, FPRC persigue una estrategia centrada en asfixiar militar y económicamente a UPC al objeto de constreñir a su líder, Ali Darrassa, para que sume a una renovada y poderosa coalición de grupos ex Séleka capaz de hacer valer sus exigencias políticas ante la jefatura del Estado centroafricano, o bien para obligarle a abandonar el país. Desde una óptica más concreta, diciembre de 2016 fue un mes especialmente intenso en cuanto a la elevación del tono amenazador de FPRC. Sus líderes no solo expresaron públicamente una manifiesta determinación para apoderarse de Bambari—cuartel general de UPC e importante enclave estratégico entre Bangui, Sudán y la República Democrática del Congo (RDC) — sino que, sorprendentemente, desvelaron una segunda opción consistente en capturar ciertas porciones de la prefectura de Basse-Kotto, también controlada por UPC, para estrechar el cerco militar sobre este grupo armado. Lo que, según los cálculos de FPRC, iba a materializarse en el control de importantes ingresos, en forma de impuestos ilegales, derivados de las actividades mineras (diamantes y oro) y agrícolas (café) endicha zona. En ese contexto, además, FPRC hizo pública su alianza con los grupos anti-Balaka (AB)con el objetivo declarado y compartido de desalojar a Ali Darrassa, al que tanto unos como otros consideran un «mercenario» extranjero. Es preciso señalar que esta asociación, a todas luces contra natura entre ex Séleka y anti-Balaka, ejemplifica la naturaleza tan oportunista como efímera que suelen tener los compromisos entre los principales actores en el tablero de juego centroafricano. Y, a su vez, desacredita la tesis de que el conflicto en RCA hunde sus raíces en la dicotomía religiosa entre cristianos y musulmanes. A lo anterior, se le sumaba la creciente difusión de informaciones —en no pocas ocasiones de dudosa credibilidad— sobre refuerzos en combatientes, armas y municiones por parte de ambos beligerantes. Pero también de advertencias que apuntaban a potenciales represalias de la coalición liderada por FPRC y las milicias AB contra la comunidad fulani en general, pues no puede obviarse que la mayoría de los combatientes de UPC comparten este origen étnico. Tras estas breves pinceladas contextuales, se reproduce el análisis tal y como fue diseñado hace aproximadamente un año (texto en inglés). Posteriormente, y antes de concluir esta contribución con algunos comentarios sobre la metodología empleada, se examinará cuál ha sido el curso de acción o escenario que más se ha acercado a la realidad de los hechos. 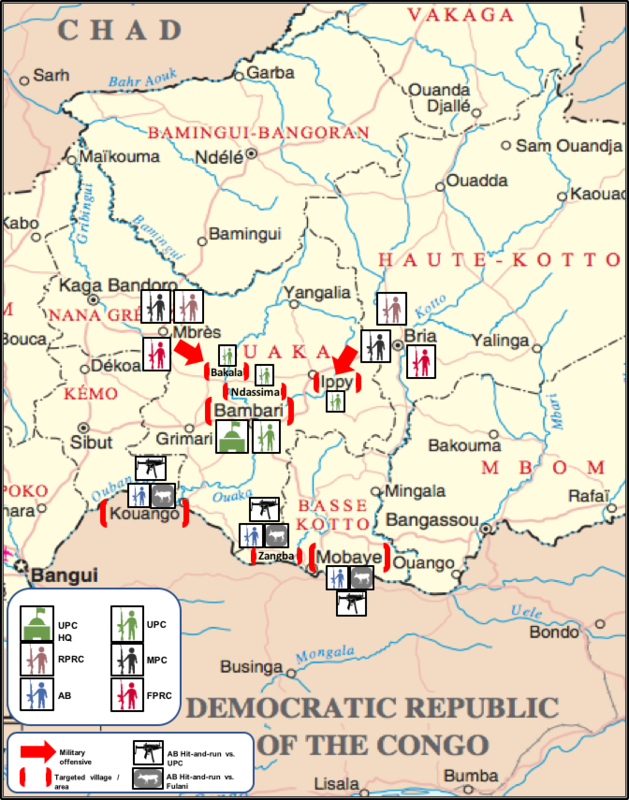 This paper sets out a series of scenarios deriving from the strategy of the Front populaire pour la renaissance de la Centrafrique (FPRC)-led coalition to asphyxiate the group Unité pour la paix en Centrafrique (UPC) in Ouaka and Basse-Kotto. 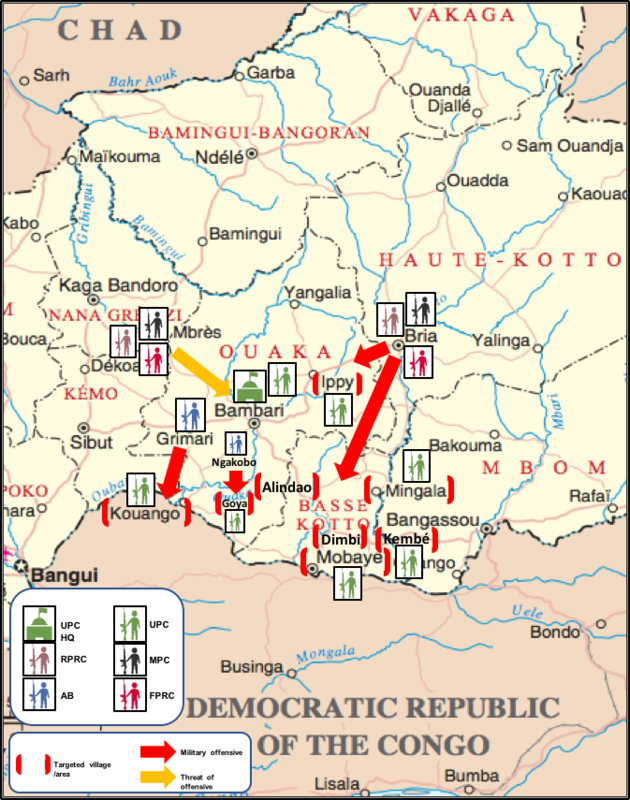 The proposed outcomes result from a combination of two main game drivers for FPRC: (a) the geographical scope of the attacks, either in Bambari or in its periphery; (b) the intensity of the military offensive against UPC,varying in the range of a full-scale one anda war of attrition. A. The FPRC-led coalition besieges Bambari, forcing Darrassa either to fleefrom there or to join a renewed Seleka coalition, thus accepting the cohabitation with the rest of ex Séleka factions in town. B. The FPRC-led coalition launches a full-scale offensive to remove UPC from its peripheral positions in the prefectures of Ouaka and Basse-Kotto, and attempts to seize its main sources of revenues and/or to prevent the mining exploitation activities by UPC. C. The FPRC-led coalition embarks on a war of attrition in Bambari by promoting criminal hit-and-run actions to be conducted by Anti-Balaka (AB) and the Rassemblement patriotique pour le renouveau de la Centrafrique (RPRC). D. The FPRC-led coalition seeks the military attrition of UPC along the Bakala-Ndassima axis, and sporadically engages UPC in Ippy. Meanwhile, AB conduct a guerrilla warfare-type within the UPC-controlled areas in Kouango, Ngakobo, Zangba and Mobaye. § Tactical approach focused on a full-scale offensive to defeat UPC and coerce Darrassa to capitulate. § FPRC credibility as military power questioned after being pushed back in Ndassima and Bakala. § The FPRC-led coalition forces outnumber those of UPC, but the latter opposes a tough resistance. § The FPRC-led coalition conducts a military offensive into Bambari through the bushes and/or the transhumance corridors to avoid MINUSCA Force. § MINUSCA Force is overstretched and prioritizes the protection of civilians around the IDP sites, as well as the protection of UN staff and assets, thus failing to prevent a massive penetration of the FPRC-led coalition fighters into Bambari. Sequence of events and implications: the FPRC-led coalition is resolved to get rid of Darrassa by force if necessary. Unlike previous attempts to seize Bakala and Ndassima (north of Bambari) with a limited number of fighters, the coalition launches a renewed, full-scale military offensive from Mbres to besiege Bambari with the aid of foreign mercenaries. It leads to a violent confrontation with UPC and armed Fulani positioned along the transhumance corridors, as the coalition avoids facing MINUSCA Force deployed on the main axes. 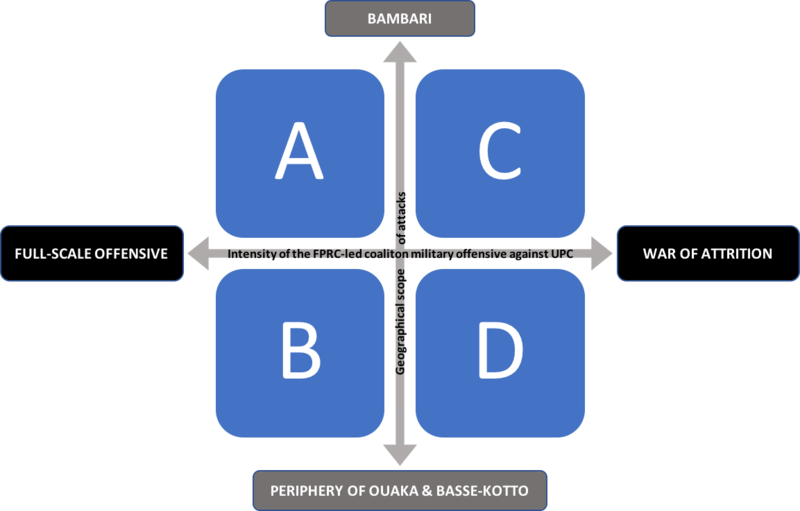 Simultaneously, AB elements based in Grimari —and likely reinforced by combatants from Kemo— move towards the Bambari-Lihoto axis. Once there, they join RPRC and AB fighters in the outskirts of Bambari to cross the Ouaka River and open another front line against UPC. Since this armed group is surrounded by hostile forces nearby, Darrassa capitulates. UPC then joins the rest of ex-Seleka factions and accepts to cohabitate with them in Bambari. The agreement for a ceasefire mitigates the risk of civilians as collateral damages resulting from an open armed confrontation in town. 1. UPC mobilizes reinforcements to defend its stronghold in Bambari, and the village becomes the stage of violent and deadly confrontations. 2. UPC flees into the bushes and embarks on a guerrilla warfare. An unpredictable number of fighters of UPC defect and join the FPRC-led coalition. § Tactical approach focused on a full-scale offensive to oust UPC from the boundaries of Ouaka and Basse-Kotto, and also to choke its main sources of revenues. § FPRC credibility as military power questioned after being defeated in Ndassima and Bakala. § The Fulani community is fully mobilized and heavily armed. 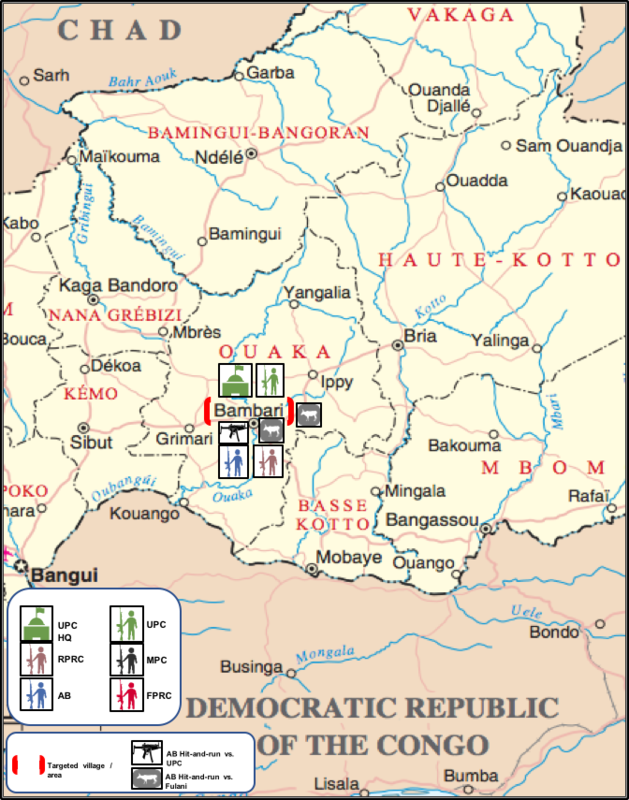 § The scarce presence of MINUSCA Force in Kouango and across Basse-Kotto enables the escalation of clashes between the armed groups, and increases the likelihood of intercommunal violence. 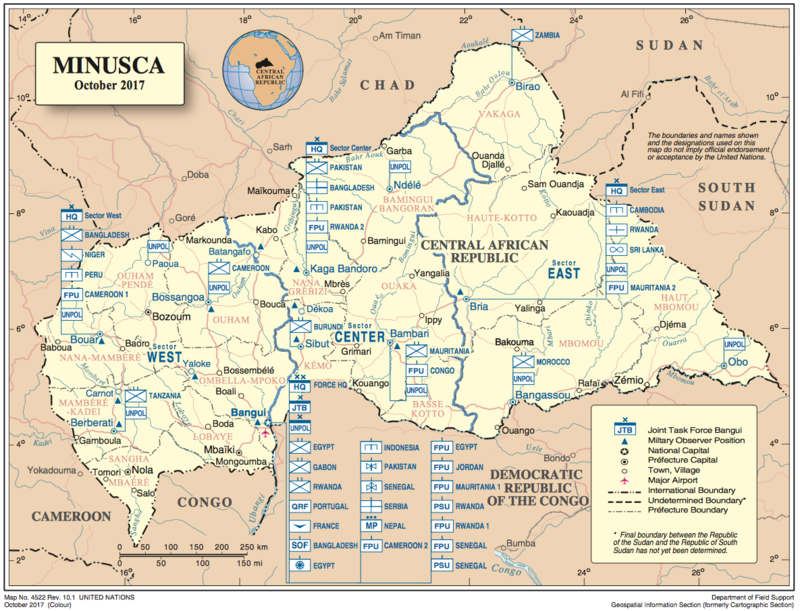 Sequence of events and implications: shaken by its significant losses in combats around Bakala and Ndassima, the FPRC-led coalition undertakes a large-scale military campaign to deprive UPC from its remote positions in Ouaka and Basse-Kotto. While the threat of animpending offensive from Mbres into Bambari hampers the UPC reinforcement of those peripheral positions, the FPRC-led coalition seeks to seize control over diamond-rich areas such as Mingala, Dimbi and Kembé and/or to destabilize them to prevent mining exploitation revenues by UPC. At the same time, AB fighters launch an offensive from both Grimari and Goussièma into Kouango, and from Ngakobo towards Goya, to force the UPC retreat. Thus, AB enlarge their area of influence southwards to benefit from taxes on coffee production along the Grimari-Kouango axis. The robust resistance by UPC and Fulani militias against AB in their advance, results in a series of deadly confrontations and civilian casualties. The intensification of clashes due to the limited presence of MINUSCA Force increases the likelihood for civilians to become not only collateral damages, but also direct targets for pillages and other potential crimes such as sexual gender abuses. In Kouango sub-prefecture, there is a dramatic upturn of intercommunal violence involving transhumant Fulani, Muslims and UPC on one side, and AB and the Christian community on the other side. § Tactical approach focused on a war of attrition against UPC in Bambari consisting of verbal threats, the FPRC-led coalition alleged military build-up, and sporadic provocative actions without engaging UPC in an open confrontation. § Military strength stalemate between the FPRC-led coalition and UPC. § UPC maintains a heavily armed presence along the transhumance corridors near Bambari, and the FPRC-led coalition hesitates to engage UPC in such grounds. Sequence of events and implications: given the military standoff, the FPRC-led coalition embarks on a war of attrition in Bambari. AB and RPRC fighters become major players in implementing such tactics. In addition, they attempt to radicalize and recruit internally displaced people (IDP) residing at the IDP camps. As a result, there is an increase of criminal hit-and-run attacks on transhumant Fulani and provocative actions against UPCin Bambari. Similarly, the Arab community reportedly well-armed and loyal to “General” Faya occasionally targets Fulani residents and UPC elements also in Bambari. 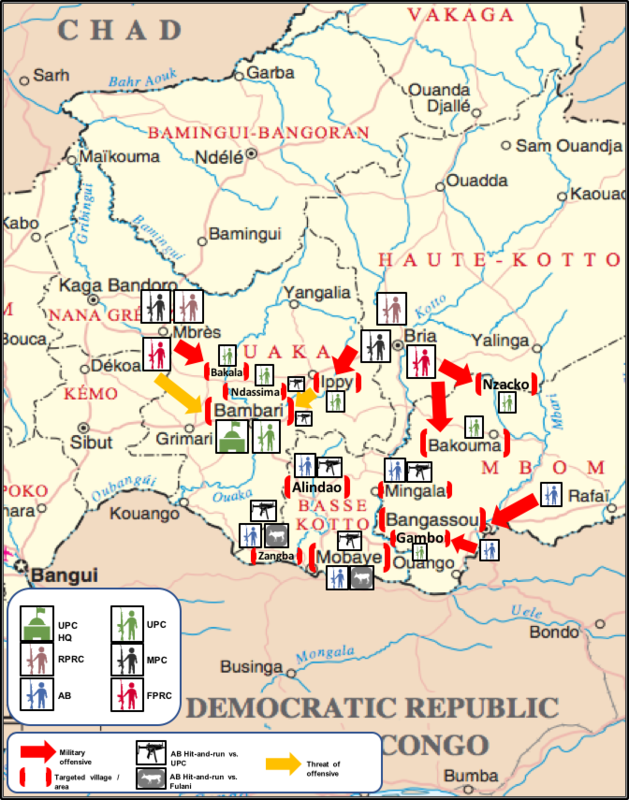 § Tactical approach focused on the military attrition of UPC in the boundaries of Ouaka and Basse-Kotto, combined with hit-and-run tactics against Fulani—and likely against the Muslim community in Kouango. Sequence of events and implications: the FPRC-led coalition launches a series of offensives on the Bakala-Ndassima axis from Mbres, and sporadically engages UPC in Ippy (northeast of Bambari) from Bria. Concurrently, AB conduct a guerrilla warfare within the UPC-controlled areas in Kouango, Ngakobo, Zangba and Mobaye. They primarily target Fulani and Muslim traders. Since AB use the IDP camp in Ngakobo as a safe haven, UPC conducts indiscriminate retaliatory attacks on this location. As a result, the levels of intercommunal violence remain high but lower in intensity when compared to those described in scenario B. Furthermore, the FPRC-led coalition struggles to enlarge its popular support through the exploitation of grievances against UPC from other ethnicities such as Gulas, Rungas and Arabs in Basse-Kotto. Additionally, the coalitional so attempts to disengage the Fulani community from UPC by offering them protection. The most likely outcome derives from a combination between scenarios C and D. This is predominantly driven by the alleged military strength stalemate and the need for the warrying parties to minimize both human and material losses. 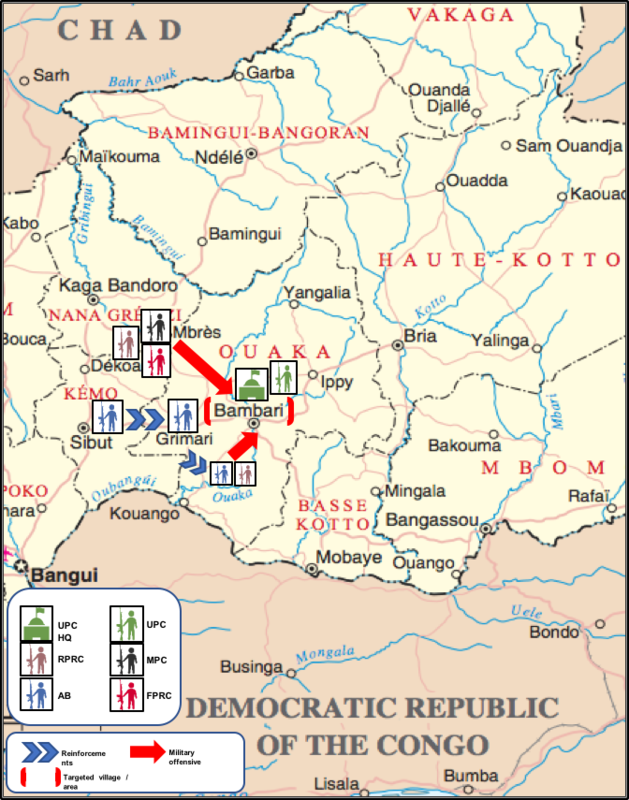 Nevertheless, this scenario is subject to a rapidly evolution towards A or B if the participation of new spoilers in support of the FPRC-led coalition results in a large reinforcement of its military capabilities—notably the arrival of foreign mercenaries and arms supplies— that generates the sufficient confidence to endeavor a full-scale attack into Bambari or against the UPC peripheral positions in Ouaka and Basse-Kotto. In scenarios A, B and D, UPC incomes from mineral exploitation and coffee production are likely to be interrupted or diminished, thus jeopardizing the group’s logistical and military capabilities. Las principales ventajas del análisis de futuros alternativos son el ahorro de tiempo en su elaboracióny su valor para sintetizar, en cuatro escenarios probables, entornos complejos con multitud de variables y sobre los que existe un mar de información. Si el ahorro de tiempo y la síntesis son apreciados por las instancias de decisión, especialmente en situaciones de crisis, no es menos cierto que la ausencia de una excesiva complejidad facilita la labor de los analistas. Ahora bien, como salvedad a esto último, cabe señalar que resulta muy conveniente la integración en el ejercicio de un experto en la materia. Pues la elección de solo dos variables puede constituir una apuesta bastante arriesgada. Por otro lado, y en relación el punto anterior, el análisis de futuros alternativos presenta la limitación de tener que dejar fuera variables en ocasiones esenciales y que, sin duda, enriquecen el trabajo prospectivo. Para ello, si se dispone de tiempo suficiente y recursos, puede utilizarse la técnica de generación de escenarios múltiples. Si el lector ha llegado hasta aquí es porque seguramente esté interesado en saber cuál de los escenarios construidos se ha ajustado más a la evolución de la realidad. Como se pronosticaba más arriba, los acontecimientos a partir de enero de 2017 han discurrido entre la combinación de los escenarios D y C, con mayor peso del primero. En febrero de 2017, los enclaves mineros de Bakala y Ndassima, dominados hasta el momento por UPC, pasaron finalmente a manos de la coalición liderada por FPRC tras varias ofensivas y contraofensivas que, desde noviembre de 2016, habían producido cierto desgaste militar de UPC (escenario D). Desde entonces, FPRC se beneficia de los ingresos ligados a la extracción de oro en dicha zona. Por las mismas fechas, además, la coalición se apoderó de Ippy sin ningún tipo de resistencia por parte de UPC, pues los combatientes se retiraron de sus posiciones en la localidad sin presentar batalla. Con respecto a estos hechos, es preciso matizar que la ofensiva militar de FPRC sobre Ippy tras recibir armamento, munición y hombres, fue más bien propio del curso de acción descrito en el escenario B. Mientras tanto, FPRC ha seguido manteniendo un tono amenazador sobre sus expectativas de ocupación de Bambari, al tiempo que sus aliados AB llevaban a cabo acciones provocativas contra UPC en las proximidades de esa localidad (escenario C). En los meses posteriores, el cerco sobre UPC se ha estrechado todavía más. En marzo, el movimiento político-militar liderado por Darrassa perdió sus posiciones más periféricas: los enclaves mineros de Bakouma y Nzacko, ambos en la prefectura de Mbomou. Poco después, los grupos AB conseguían hacerse con el control de Bangassou, localidad que durante los últimos años había conseguido eludir a la presencia de grupos armados. Más recientemente, en agosto, los combatientes AB han llevado a cabo una nueva ofensiva contra las posiciones de UPC en Gambo, otra de las capitales sub-prefectorales de Mbomou donde Darrassa todavía conserva su presencia militar. De manera similar, un nuevo foco de inestabilidad amenaza la prefectura de Basse-Kotto; es decir, el flanco sur/sureste de los territorios tradicionalmente controlados por UPC. Desde abril, las milicias AB han llevado a cabo numerosas acciones armadas de tipo hit-and-run contra UPC en las proximidades de Alindao, Mobaye, Zangba y Mingala (escenario D), a lo que Darrassa suele responder mediante represalias sobre la población civil, acusada de prestar apoyo y encubrir a los combatientes AB. Potencialmente preocupantes son, por otra parte, los reiterados ataques de estos últimos contra los cascos azules desplegados en la zona; una nueva y alarmante dinámica que se añade a las no menos preocupantes manipulaciones e intentos para deslegitimar la presencia de la misión onusiana en República Centroafricana. 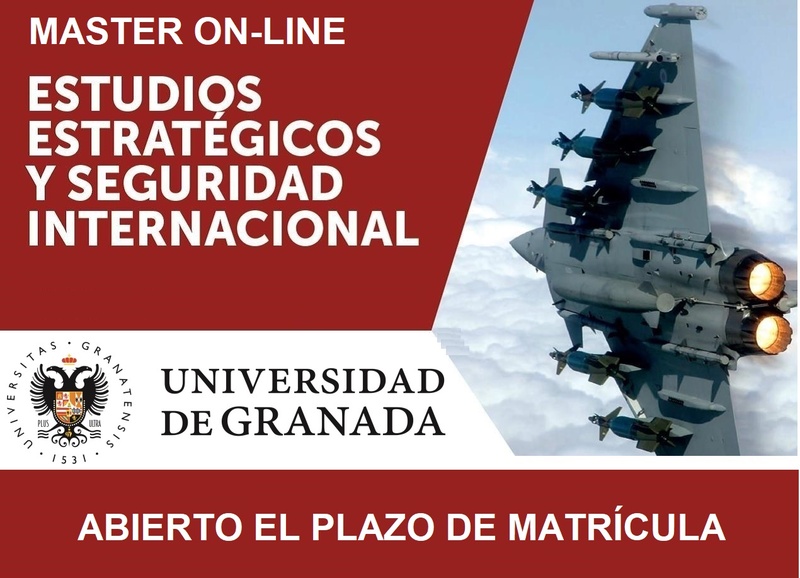 Jorge Comins es Politólogo especializado en Relaciones Internacionales y Seguridad. Ex analista (JMAC) en la Misión Multidimensional Integrada de Estabilización de las Naciones Unidas en República Centroafricana (2015-2017). Nota: "Las ideas y opiniones expresadas en este artículo no reflejan, necesariamente, la posición oficial de las Naciones Unidas, y deben ser atribuidas exclusivamente a su autor". Para ampliar información sobre los aspectos metodológicos relacionados con esta técnica, véase Heuer, Richards J. y Pherson, Randolph H., Técnicas Analíticas Estructuradas para el análisis de inteligencia, Plaza y Valdés, 2015, pp. 144-146. Por razones operativas, la Misión Multidimensional Integrada de Estabilización de las Naciones Unidas en República Centroafricana (MINUSCA), divide el territorio centroafricano en tres extensas áreas de responsabilidad o sectores: oeste, centro y este (ver mapa). Para una mayor comprensión de las dinámicas conducentes a esta situación, léase “Contexto político y de seguridad en la República Centroafricana tras las elecciones de 2016: de la frustración compartida a la confrontación armada de las facciones ex Séleka” (Análisis GESI 8/2017). Since 21 November 2016, RPRC fighters are sheltered by AB in the neighborhood of Kidjigra (western Bambari), which is an area fully controlled by the latter group. Former UPC Chief of Operations and dissident (since 4 July 2016) now reportedly combating alongside the FPRC-led coalition. It should be noted that, in the past, the Arab community in Bambari has been systematically targeted by UPC —notably as victims of reprisals, illegal arrests and detentions. Heuer, Richards J. y Pherson, Randolph H., op. cit, pp. 146-149.